Our dear friend Shashi was just about to leave for another travel adventure. She had been globe-trotting for over 20 years, living simply and mostly out of her back pack and a rolly suitcase. She has been almost everywhere, including Tibet and Latin America. This trip was to go back to India, seeking wisdom at her favorite Ashram. Before she left we persuaded her to meet at a friend’s apartment and go through her entire backpack kit. Over the years she had refined the things she carried to get the lightest items, but also the strongest and long lasting items. I know that one of her favorite places was REI in Santa Monica for excellent camping gear. She agreed to share her experience and go through the items that she has found to be a necessity for extended travel and adventure. She caries a water filter, a rice cooker, and a device to grind nuts and seeds, because she will be eating mostly things she prepares and finds in even small villages, including rice, beans and fresh veggies.. Being on the road can be expensive if you travel like a rich tourist and stay in hotels and have all meals in restaurants. Shashi prefers to be on foot or bus and find a really cheap place to stay or camp and cook her own food. This savings allows her to travel constantly on a very small fixed income. She also works a little along the way, or trades services with businesses. She has fixed computers, done bookkeeping, is a licensed acupuncturist, a trained karate security guard, and many other talents. Please enjoy the video below and following that some photos we took of her equipment. Notice that to keep organized, things are kept in cloth or vinyl waterproof bags and little pouches. For instance, the first aid kit is in one bag, toiletries in another, food prep stuff in another. That keeps everything organized in her backpack. Note: The video below is only 16 minutes. We will upload the entire 50 minute version soon. I am very sad to say that our dear friend passed away on her last trip in early 2019, due to being caught in a dreadful storm and getting pneumonia. We will certainly miss her calm disposition and great knowledge. This is her last gift to those who live out of their backpacks, by choice or by chance and hard times. She was so happy to share this information with everyone at gypsycool. Rest In Peace dear Shashi Harrie. It’s Much More Comfortable, and Still Allows Bus Patrons to Sit Down! Plenty of homes for those who can afford 2-5k a month in rent. Tents for those who cannot. Not only true in San Diego, but all over California. Redevelopment, Urban Renewal, and other programs that gave billions to real estate and development companies are one cause. They built thousands of luxury units and a few “senior” apartments that quickly became occupied by seniors from other countries who were “political refugees.” Not many Americans in these places, full of old people from around the world who never worked a day in their lives in the U.S., but now on the dole, getting eternal payments from Uncle Sam. The politicians in Washington forgot who put them in office, forgot about our U.S. born seniors who worked their whole lives here and paid taxes, forgot about our injured veterans, forgot about their responsibility to us, not to some senior from Eastern Europe or the Middle East, of which hundreds of thousands occupy the so-called low income senior centers. Don’t believe me? I would be happy to send you to some of these in L.A., see for yourself. A big secret nobody ever wants to discuss. Huge immigration, legal and illegal, without any planning also added to the problem. No, we don’t need any more “refugees” or immigrants until the government cleans up the mess that they have helped to create. If anyone, from any country, wants to come to the United States, they should be able to pay an entrance fee of $250,000 per person and prove they can support themselves for 10 years. The money goes to build low cost housing for the millions of OUR displaced persons living on the streets. If the rich politicians in Washington want to bring in more “refugees” then let them personally pay the $250,000. My prediction is that not even one would come in under that stipulation. Too harsh? The situation has led to a class war and a government movement to criminalize poverty. Look at the so-called laws now being passed. Illegal to be poor, illegal to sleep on a bench, illegal to feed hungry folks, illegal to give a homeless person a free haircut, illegal to feed hungry folks in a park, illegal to sleep in a tent on public property, illegal to sleep in your vehicle, in L.A. illegal to have a pillow in your car says new “Goofy Garcetti” law. 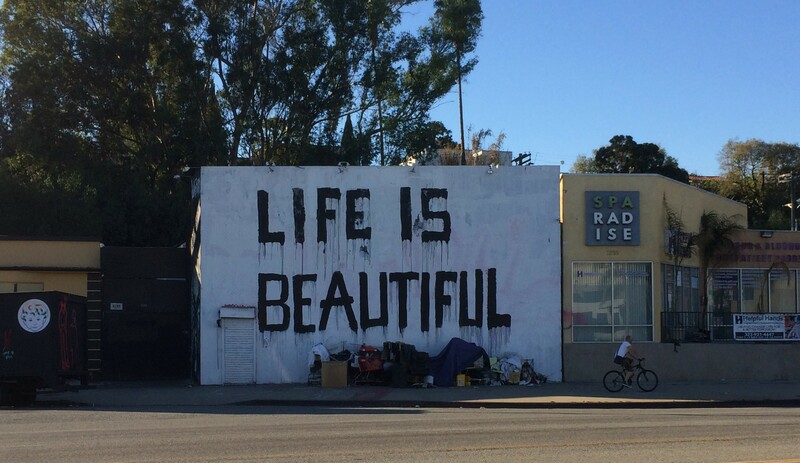 Huge “encampment sweeps” around the country, taking tents and sleeping bags from homeless folks to the dump, trashing private property of homeless, in some cities “rounding up” homeless people and moving them out to some desolate “camp” with orders not to return to the city. On and on it goes, and every one of the items above have been published on this website. It’s a brutal class war on the poor. Even students now suffering. Think about it. How Society Deals with a poor person. In a stunning series of videos, Michael McConnell has documented the scores of “Encampment Sweeps” where San Diego cops, security guards, and sanitation workers raid various areas of the city and grab the private property of the city’s poor homeless folks and send it to the garbage dump. In video after video, these heartless raiders destroy what little is left for a poor homeless person living on the street in a tent or cardboard house. This, of course, does nothing at all to work towards a solution to homeless issues, it just further pounds these poor folks into further despair. The so-called “sweeps” are the latest tool that cities across America are using to make poverty a criminal offense. Arresting homeless folks for sleeping in a tent and looting all their belongings is a reflection of the dissolving and breakdown of our civil society. It is the tip of the iceberg of the new class war that is pitting the rich against the poor. The massive shipment of jobs to China and the far east has led to the shuttering of thousands of factories across the country, pushing former middle class folks out of their homes and into the streets. What has become obvious is that the rich class is now in a frenzy of cruelty. These “sweeps”, now taking place in most cities, is but the first round of the harsh things to come. Some cities are even moving homeless folks out to the suburbs into “camps” and they are forbidden, under threat of arrest, to return to the city. These are the forerunners of Nazi-style concentration camps that murdered millions in Europe during World War 2. The irony is that many of the homeless men are themselves veterans of the various ongoing wars that the U.S. is waging around the world. Returning home from service, often with physical and mental disabilities, they end up on the streets. Now their paltry belongings are being seized, their tents thrown into garbage trucks. It is a sad end to the American dream. Check out Michael McConnell”s videos Click Here. A surging homeless population in San Diego is the subject of Michael McConnell’s Facebook Page called Homelessness News San Diego. He keeps tab of City activities and the relentless drive to “clean up” and move out the hundreds of tent camps in the downtown area. Surging rents in San Diego, as in other big cities are driving out the working class and young folks who cannot pay the $1800. per month for an apartment while working jobs that are at minimum wage. 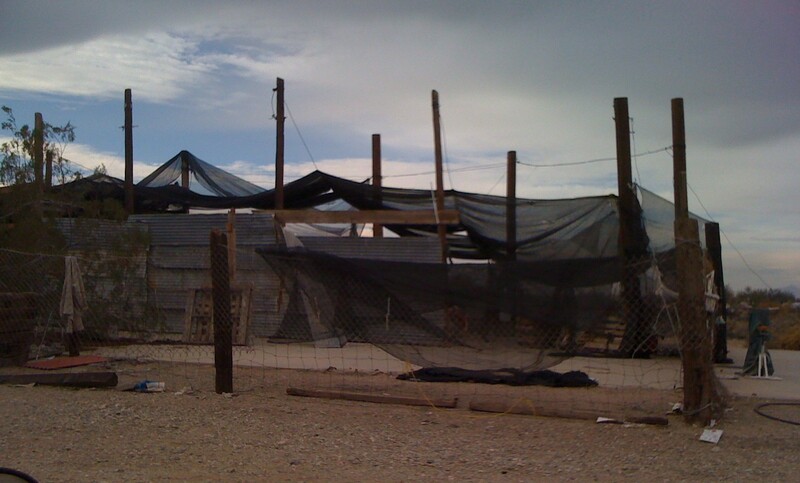 This drives them to living in vehicles or worse, living in a tent on the street. Click Here to view Michael’s Facebook Page. 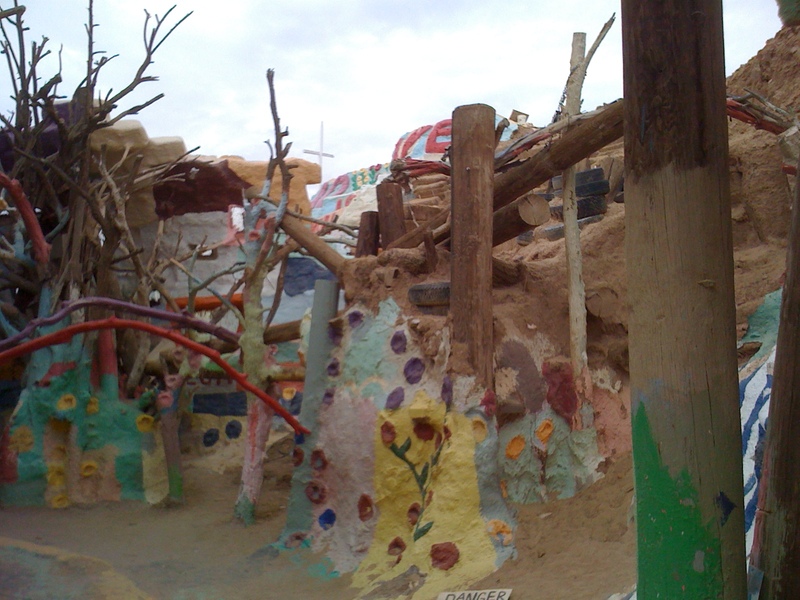 A Visit to Slab City – the Future of Civilization? 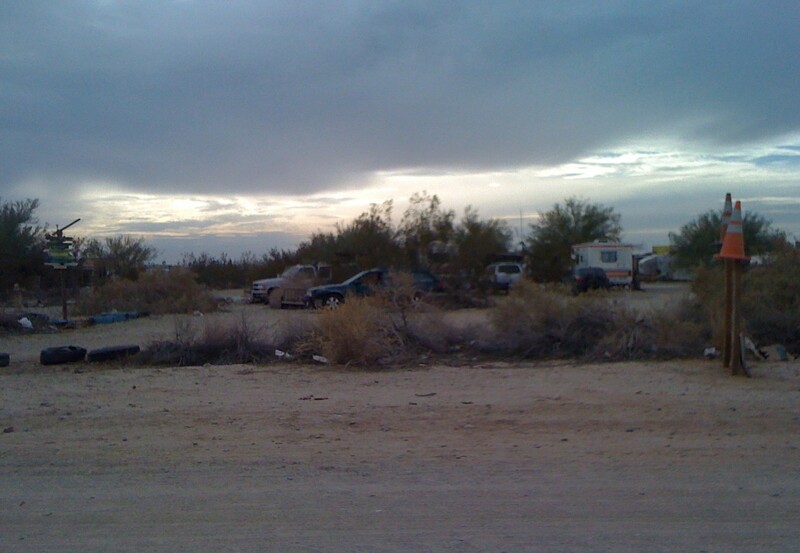 I rolled into Niland, California on a lightly-overcast afternoon in the middle of December. 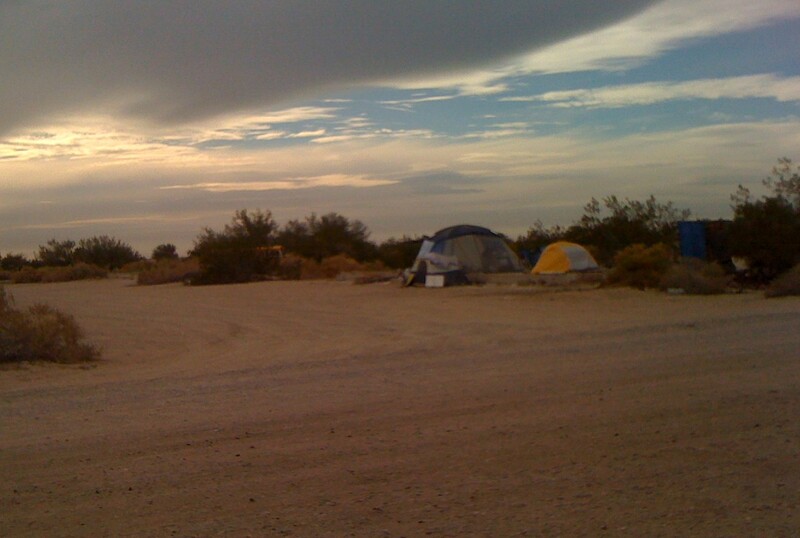 The sun is almost set, but there will easily be enough light to get to Slab City and find a suitable spot to camp tonight. The street going east out of Niland [Main Street] is little better than the washboard road that goes out to Area 51, except this is only three miles long instead of fifteen. Driving down this road you begin to get a sense of just how immense this place is. It was originally Camp Dunlap Marine Base from 1949 to 1956 (yes, they tore it down after only seven years), which explains the big concrete slabs that give the place its name. 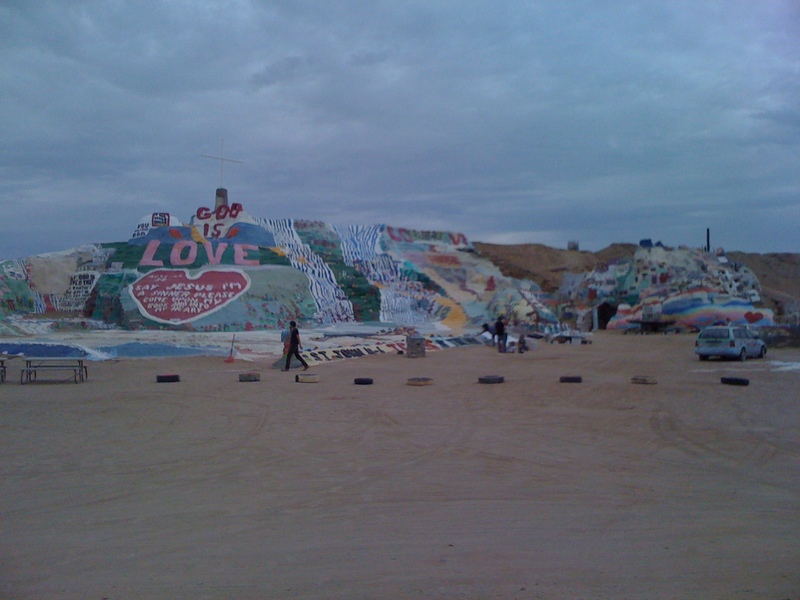 First thing you come to is Salvation Mountain on the right, some guy’s huge multicolored religious monument. Moving on, there are scores of RV’s, buses, trucks and vans scattered every which way as I cruise along the dusty jarring road. Looks a lot like Burning Man, except people are more spread out here and this desert actually has some vegetation. It’s been called “The Last Free Place”, and there are good reasons for that. It’s around 50 miles southeast of Indio (itself a desolate desert metropolis) out in the middle of the Sonoran Desert and almost at the south end of the Salton Sea. There’s also no electricity [unless you make your own], running water, trash pickup, or restrooms – you pack in everything you need. Rattling along looking for an out-of-the-way spot, I end up heading off toward the back. There are a lot of packed-dirt trails heading off in various directions. Looks like most of the better-looking vehicles are back here, so this is definitely the place to be. There are quite a few solar cell arrays and wind generators at this end of town as well. I cruise down one path and see a five-foot rise about a couple hundred yards down. The van slips a bit going up, but makes it easily to the level top. 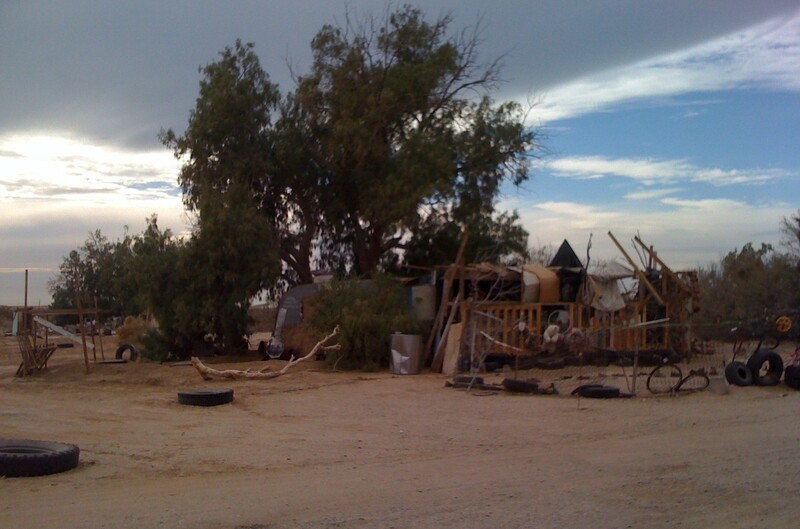 There are scrub bushes on either side, with small piles of rusted cans at their base. In fact, there’s trash like that everywhere around here. Most bushes have at least some kind of refuse under them: discarded clothes, cans, plastic bags, or heaven alone knows what. Hopping out to stretch my legs, the temperature is in the upper 60’s with low humidity. Nice and quiet, except for about four or five dogs barking in scattered directions. It’s dark in about an hour and the full moon rises in the southeast. Occasional stars peek through the low clouds and a gas generator hums somewhere off to the north. A few campfires are going, which gives a smell of creosote to the air. Some barely audible voices drift through the light breeze, presumably from the campfires. I get back in the van, pop open a can of Ravioli, and watch a movie on the DVD player. After that I drift into a dreamless desert sleep. Just after 7:30 in the morning I wake up to the sound of faint yelling. Cracking open my passenger window, I see some dude standing on a huge raised slab with multicolored grafitti abut a hundred yards away screaming challenges to an unknown person. He’s pacing back and forth, flailing his arms wildly, while pointing out the apparent cowardice of his rival – who appears to be entirely imaginary. Probably acute amphetamine psychosis, a meth-head burnout. Guess he just went off the deep end; isolation like this doesn’t work for everyone. Using the sighting scope, he’s short, a little stocky and wearing an Army jacket – doesn’t even look to be thirty. After about a half hour, his voice starts getting a bit hoarse, so he hops on his bicycle and heads in the direction of town. His manic threats slowly fade out into the crisp morning air. I have my usual leisurely breakfast while reading several chapters of a book, then get a little writing done on my third book. At 11:00 a pair of fighter jets from the adjacent Marine Base practice bombing runs between Slab City and the Chocolate Mountains to the east. Their sound is trailing them by at least a quarter mile or so. They head north swooping low in formation, pull up in about a 70-degree climb, then loop back the other way. After six of these exercises they fly off to the south. Show’s over. 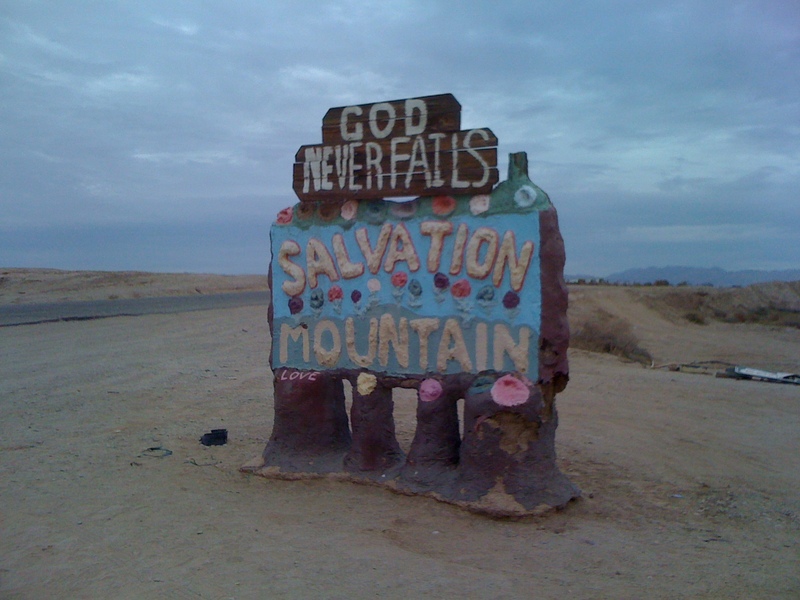 I do a little more reading, then head over to Salvation Mountain to check it out in more detail. It’s a huge monstrosity built on the face of what’s essentually a sand dune. Mostly constructed by Leonard Knight between 1984 and 2011 (he died two years ago at age 82), it’s made of large tree trunks, intertwined branches, bales of hay, salvaged metal pieces (mostly car doors), and a lot of plaster. 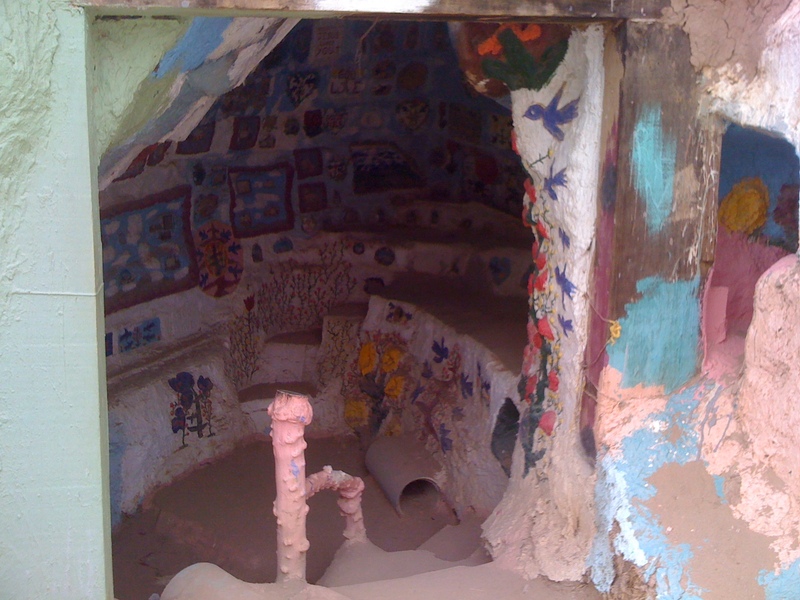 There are multiple rooms and grottoes at the south end. 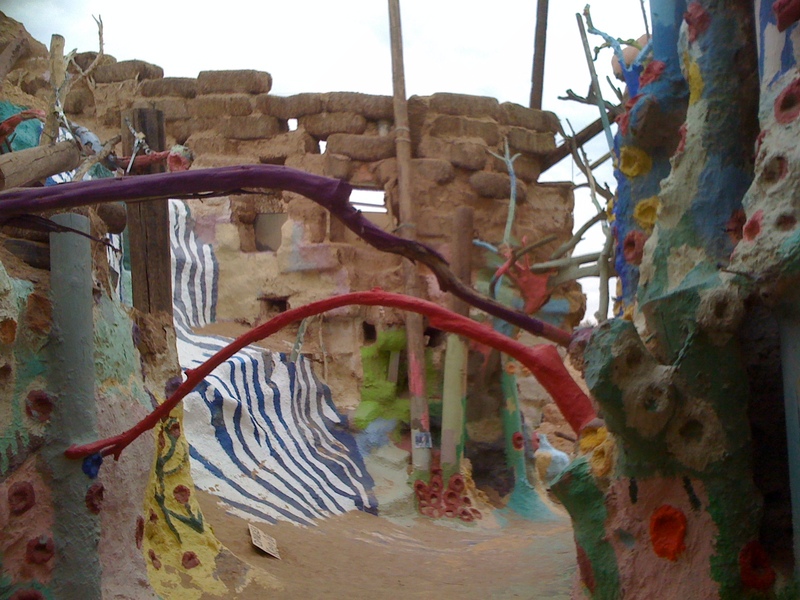 Most of the entire thing is also painted with a couple hundred gallons of salvaged latex paint of various colors. The painting still continues through sporadic volunteers. If I’d planned on hanging around longer, I would have helped out with a brush; but I’m only going to do a day here. 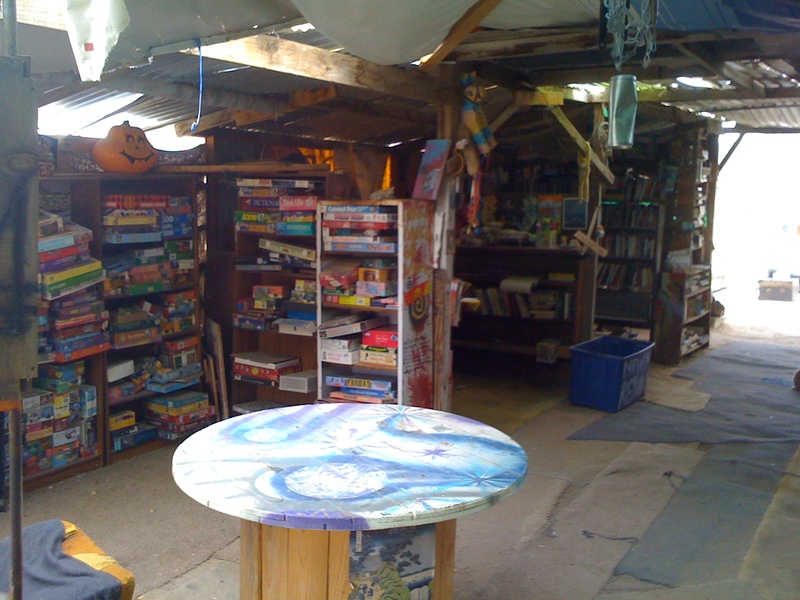 There are a couple of signs pointing to the library, so I follow them around the back past Camp Goonies (a collective of high-tech tinkerers) and eventually run into an unassuming building a little ways back from the road. At first glance, it looked to be little more than a small shack surrounded by trees, but it’s actually rather sizable. It’s open-ended at two sides and has a motley collection of rug pieces completely covering the sand floor. The precarious bookshelves look to harbor somewhere around a thousand books, by my estimate. I was told by the resident librarian (a way-cool dude whose name I forgot to write down) that it’s the “take a book-leave a book” system. I mentioned the Gypsy Cool website and he said that he’d run into it before. 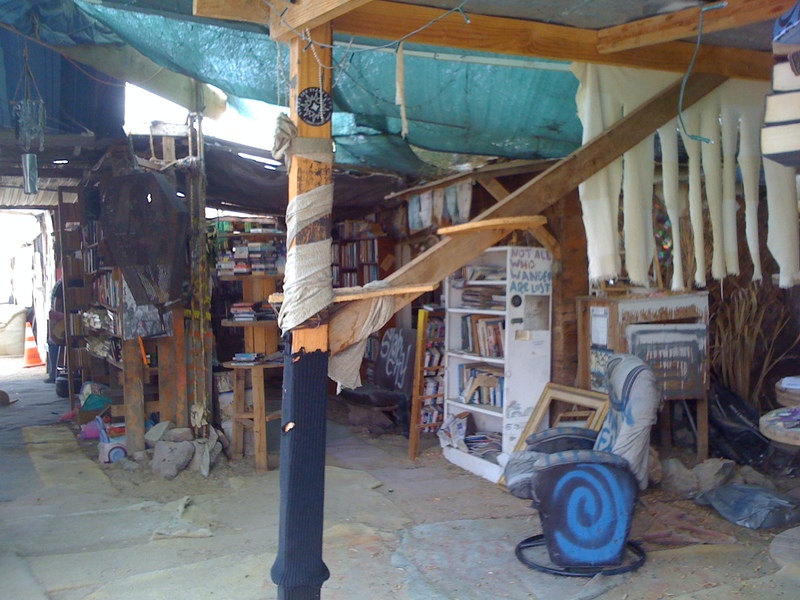 I left them several copies of my books – a lot of folks here could probably use some of the techniques described in them (which were written to help the 99%, and irritate the rest). One thing’s for sure, people definitely have a lot of time to catch up on their reading here. Not much else to do. 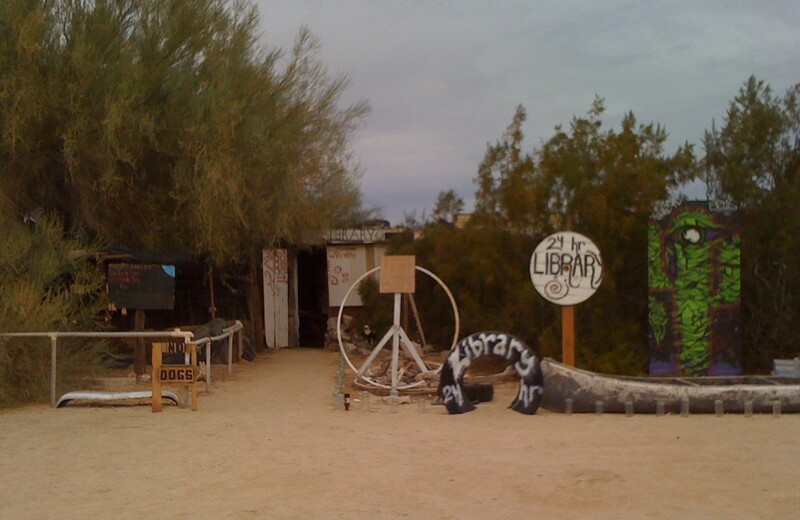 I made it a point to traverse each dusty dirt road in Slab City (there’s eight total, more or less), going past places like the Slab City Hostel, the Live Music place (true to its name), the Sun Works (a solar-related workshop), and the Slab City Christian Club (completely deserted, guess religion isn’t big here). 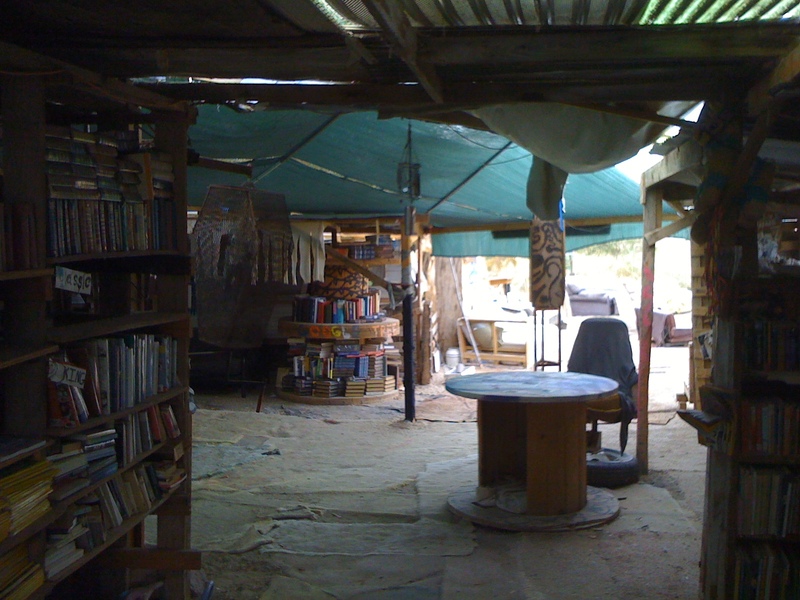 There was every kind of dwelling from simple tents to semi-permanent buildings erected on abandoned concrete foundations. Occasionally, non-functioning vehicles are built directly into these structures. 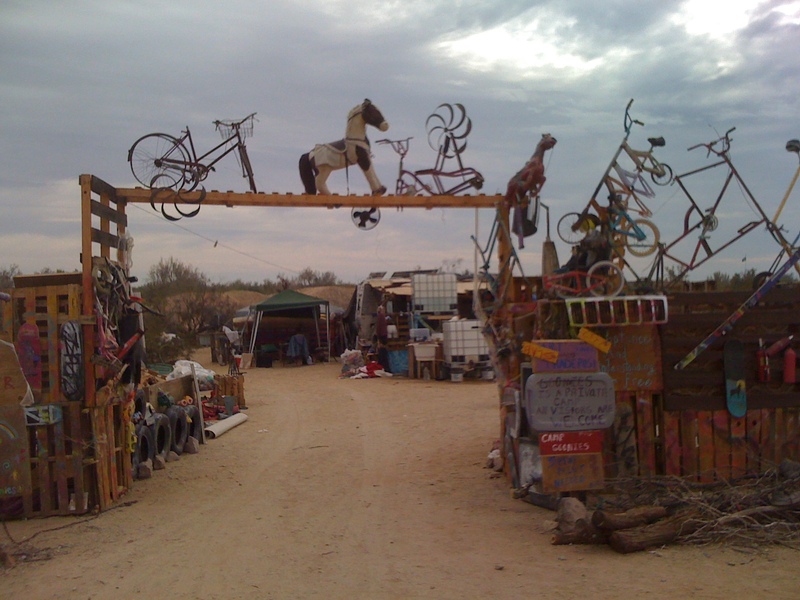 There’s some very inventive construction here using salvaged materials, with a lot of Burning Man influence – except I didn’t see any domes. There were a good number of big fancy RV’s, most likely nomadic Snowbirds from up north. On the whole, the handful of people I ran into here were reasonably friendly, for California. The younger longhairs were generally more abrasive, but that’s typical these days (Libtards, maybe?). I’d guess the median age this time of year is around 45 or so. Noticed a lot of retirees sitting around in chairs here and there, and saw only two kids. A person would need to be sturdy stock to survive here long-term in these primitive conditions, especially in the summer when the temperature is said to get up to 120 degrees. Definitely count me out on that. 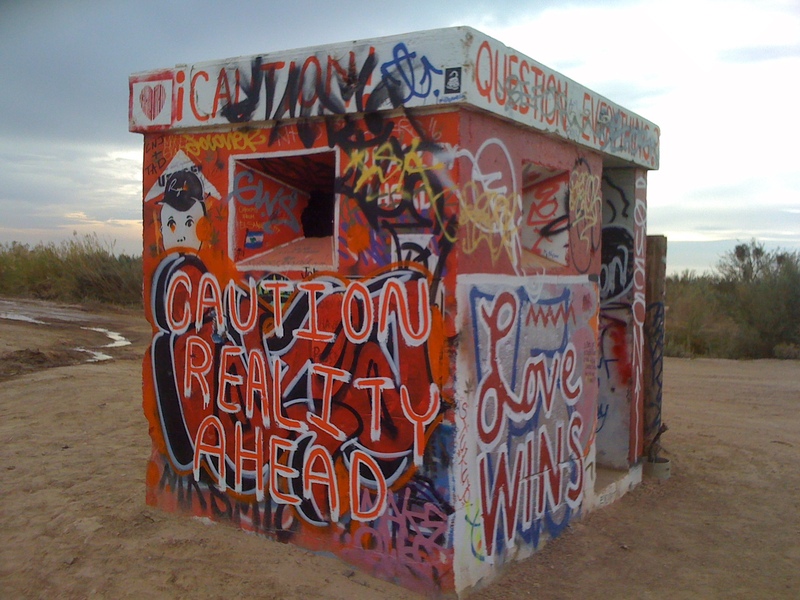 As I was leaving, the old guard shack for the Marine Base had “Caution: Reality Ahead” painted on the side – a very apt reminder. 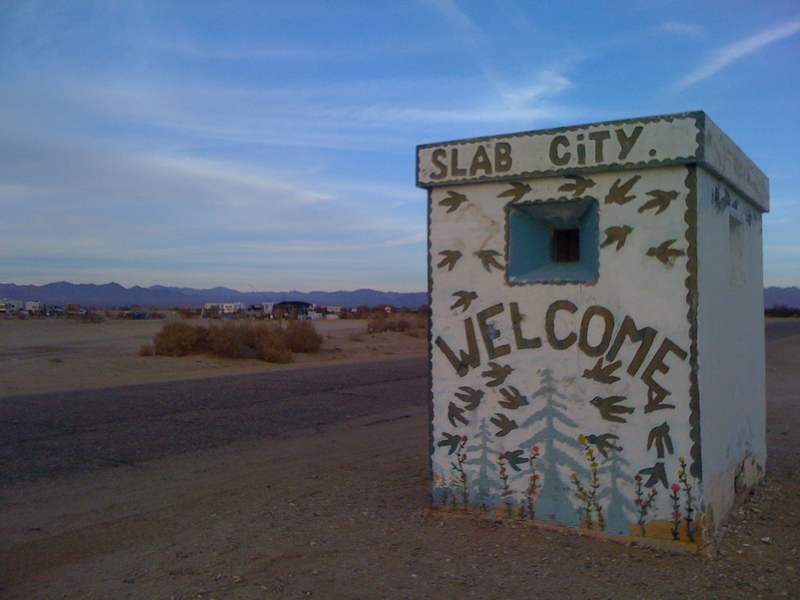 Slab City is definitely a state of mind. What it might lack in overall social cohesiveness, it more than makes up for in personal freedom. And that’s quite acceptable for “The Last Free Place” – probably in this entire oppressive Police State of America. I wish ya’ luck, guys. Let Freedom Ring.